Complementing the lens itself, the silver FUJIFILM XF 50mm f/2 R WR Lens with UV Filter Kit from B&H pairs the sleek portrait-length prime with a 46mm UV filter. A sleek short telephoto prime for FUJIFILM X-series mirrorless cameras, the silver XF 50mm f/2 R WR offers a 76mm equivalent focal length to suit a variety of applications, including portraiture and still lifes. The lightweight design and bright f/2 maximum aperture benefit working in low-light conditions and also afford a high degree of control over depth of field for selective focus techniques. The optical design features one aspherical ED element, which controls distortion and color fringing for sharper, clearer results throughout the aperture range. A Super EBC coating is also used to control flare and ghosting for improved contrast and color fidelity when working in bright and backlit conditions. Complementing the optics is a stepping motor, along with an internal focusing design, which provides quick and especially quiet focusing performance. Additionally, the lens is weather-sealed to suit working in inclement conditions. The Hoya 46mm UV Haze NXT HMC Filter is a general use, clear filter that helps to absorb ultraviolet light and protect the front of your lens. Its clear design allows you to pair this filter with others or leave on lenses at all times as a general protective filter. It can also help to reduce dust and moisture and keep them from reaching your lens element while providing additional protection in case of drops or situations where scratching could occur. 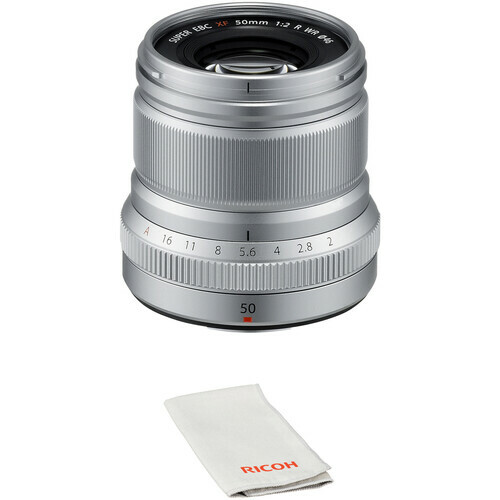 XF 50mm f/2 R WR Lens with UV Filter Kit (Silver) is rated 4.9 out of 5 by 412.